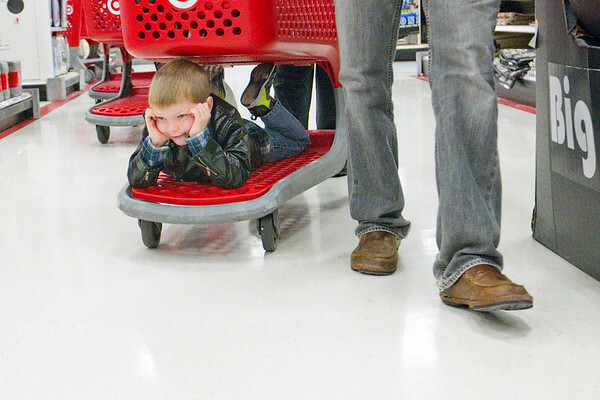 "I'm done with my shopping," said Leo Antcliff, 7, as he rode underneath a cart while shopping with volunteer Dan Farley for Christmas presents on Saturday morning at Target in Traverse City. About 25 children, paired with volunteers, did their Christmas shopping with help from the Optimist Club of Traverse City. Children from Big Brothers/Big Sister, the Salvation Army Pathway of Hope Program had up to $100 each, raised by Optimist club members, to shop on Saturday morning, with about 25 more from Child and Family Services checking off their lists on Sunday morning. Children and volunteers then had a chance to wrap their gifts and visit with Santa at the event, which has been going on for over 25 years.